George Steinbrenner IV is in many ways just like any other 22-year old guy. He loves sports of all kinds (not just baseball) and he’s an avid gamer. What’s not like others is that he is the youngest owner in the storied history of IndyCar. 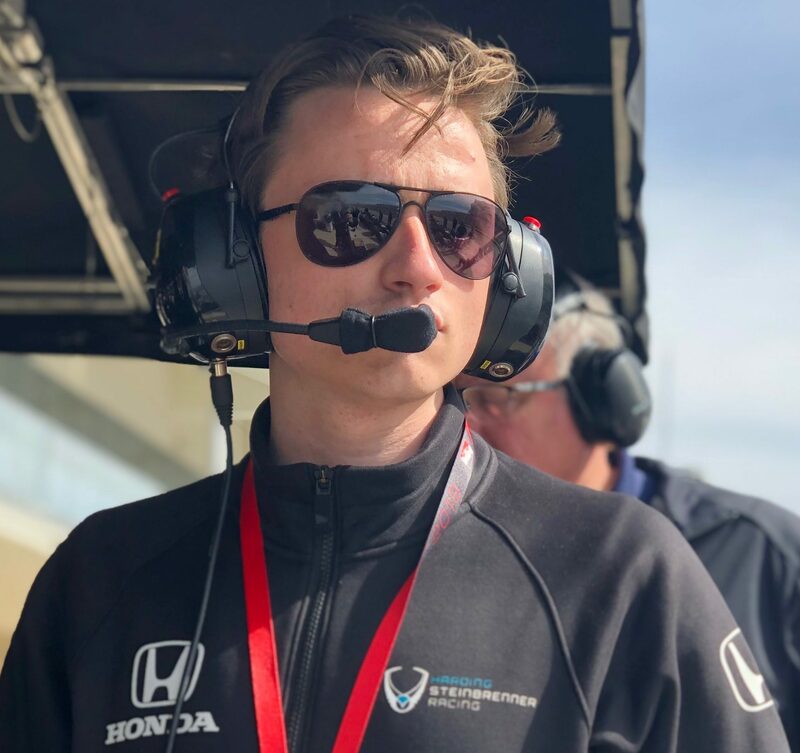 The Pit Box sat down with the Harding Steinbrenner co-owner to talk the business of the NTT IndyCar Series, surprises so far and more in this edition of Poll to Podium. PB: Well St. Petersburg and the 2019 NTT IndyCar Series season is quickly approaching. What has been the biggest surprise for you so far as a team owner? GS: There are a couple of surprises just organizationally because I’d been around, I mean I’ve known Bryan Herta for years and he would tell me things that would go on in his race team and Sean Jones, my Stepdad raced against Herta as a Junior Formula driver and he would tell me things. So, growing up around people who had the experience with and as team owners has been a big advantage. There were some things that I knew going into it, but there were some surprises. Organizationally, a sort of just the day to day structural stuff, you know, a lot of the things that you learn just owning any business or the things that I learned going into it. How to manage and build relationships with employees, team members, crew, sales folks – that more day to day operational stuff was the stuff that I learned so far. With the Harding Steinbrenner team we’ve had a great start. We have good relationships, good morale, good chemistry going on at the shop. Now we are looking forward to bringing that out to the track each time out and seeing what we can do. PB: Needless to say, you have some highly successful business people in your family primarily in baseball. Does that business acumen that you had before moving into this in a full-time role, does it apply or is it kind of thrown out the window? You treat people well, you treat sponsors well, everything’s going to be okay? Or is it a little more dynamic in that? And did your business sense change a little bit just because of the environment that you now work in? GS: Just the day to day operations. It was more getting used to owning a race team and then dealing with the problems of a race team and the solutions to those problems. Those are the differences really. You talked about baseball, it’s different but it’s sports still, so there are similarities there. And in terms of what you do day to day and what you can expect day to day – you’re focused on a lot more as a team owner. You’re focused more on the sales side than you would be say running a baseball team though you are involved. You have different focuses in different areas in which you must be more involved. PB: Forming sponsorships with partners is one of, if not the most difficult thing to accomplish in INDYCAR. Has that surprised you? There’s a nice rising tide surrounding INDYCAR with the new deal with NBC and being on a national network more than ever and all of the new sponsorships like NTT Data. Have you seen the enthusiasm for INDYCAR as you’re talking to partners and potential partners? GS: You see that rise and it wasn’t surprising how difficult it is on the sponsorship side. No matter how exposed you are from the outside, I think it surprises everyone to a degree. I was fortunate enough to grow up and learn from Bryan who was a one car team owner for years before joining with Andretti. I learned from him and talking with him about how difficult it was, especially for a one car team, a new team who is looking for sponsorships – good sustainable sponsorships. It takes a lot of hard work. It takes a lot of time, but it takes a good people. Fortunately, we have all three of those things going for us. It takes a lot of time to build commercial sponsorships in INDYCAR and we had the – I’d say maybe misfortune of only having a couple of months before the season that we set our organization up and got everything in place. But we accelerated the process with a lot of hard work and a lot of long days. We feel we’ve caught up to the curve in terms of where we’re at right now. PB: What’s the biggest hurdle in sales? The length of the commitment that is needed? I think that’s where a lot of people were thinking, Oh, you just get a bunch of people and you can stick a sponsor on the side of the car and it’s easy. But I know there’s a lot more to it than that. What’s the biggest hurdle? GS: There are two. I believe a lot of our issues with sales is the timing of where and when we really go out. Sales time is the off season, which is late September till about now and that’s a rough time when you’re trying to get people’s marketing budgets. Another big, big hurdle is it’s difficult for new sponsors to calculate what the return on investment is because it’s not really something that we can put measurably to a sheet of paper and say, this is how much money you’re going to get back. It’s easier once they have that year of experience and they understand what we can do for them, what they will get out of a motor sports sponsorship in terms of business to business relationships, in terms of client or employee or executive benefits at a race venue. Things that we can supply to that sponsor. It’s hard to express that or for them to fully understand what the full benefits of an INDYCAR sponsorship are – unless they’ve done it for a year. Unless they’re engrossed in the culture, they’re into our network of sponsors and contacts. It’s really getting that initial understanding of what the ROI (return on investment) is because it’s hard to put it down on paper and to put it in simple terms. It’s very difficult to do. PB: We’ve talked about the things that have surprised you, but what’s the coolest thing that you didn’t expect about being a co-owner of an INDYCAR team? Hear Steinbrenner’s passionate answer here as part of a Pit Box Bite! PB: It was a tumultuous two weeks leading up to testing at the Circuit of Americas and then Colton comes out and just wows everybody. Talk about that experience with testing and COTA and how satisfying was Colton (Herta) and the team’s performance finishing first in three of the four testing sessions? GS: It was very, very satisfying to just be able to focus for a few days on what I love about the sport and that’s getting on track and the competitive nature of the sport, just the sport itself, you know, take a little break from the background that we’ve been working so hard on for months now and get back to why we do those things – and that’s for the car on track. As for Colton, we all know he is very capable. We all knew that we had the equipment and the personnel necessary to be fast. We didn’t expect the top three sessions and to finish second in the fourth. I don’t think anyone really expected us to do that – even ourselves. It was really reassuring and reaffirming because we grinded hard. The crew worked really hard to get the car ready for the COTA test. They worked hard to get everything right and everything in position and it was a great feeling for them. You could see it. They felt really energized. They felt great that all their hard work came across so well on track. You’re staring at your car above the likes of Scott Dixon, Will Power, Josef Newgarden, Alex Rossi. You see all these guys who are and on top, the mainstays, the five-time champion, the top 10 all time wins leaders that were on the board there. It’s the legends and stuff. It’s crazy to see that. It was a great feeling given the hard work and lead up to that test. PB: It’s an interesting time in IndyCar. It’s an interesting time in that you just talked about some of the legends, the Tony Kanaan’s and those guys of the world and then you’ve got your young team and so many other young, great drivers. It is a very cool time just to be a part of INDYCAR right now. GS: It is, it’s an exciting time and growing up, forming my fandom during the times when INDYCAR was struggling after the split and going to NTT IndyCar Series races throughout those years from my baseline of the mid two thousands, when I started going to races to where it is now and the energy and the fanfare and the attendance and the exposure, the excitement, it’s all so different from that 15 years ago when I started to get to become a diehard. It’s so refreshing to be a part of it now and that new sort of sense of excitement and love for the sport. Growing up, I was one of the few kids that I knew that loved INDYCAR. There were a couple that I talk INDYCAR with, but it wasn’t like, you know, sitting down and talking baseball or talking football. So now just to go to these races and see all these young people, old people and everything in between is so exciting, this fanfare and excitement seems like the reinvigoration of the sport. It’s awesome that I get to be a part of it. PB: You have a lot of other interests as well. Talk about some of those interests outside of racing. You’re 22 years old. You continue to grow some of those outside interests that really catch your attention like E-Sports. Hear Steinbrenner’s answer about the future of E-Sports and the NTT IndyCar Series and why it is so important to continue to grow the sport.PB: We talked about the growth of Indy car. You’re a young owner sitting next to the Roger Penske’s of the world and all the people that have done this and been highly successful for our long time. You bring it a little different voice. GS: Most of my experience so far in what you might call the owners club and owners meetings has really been to sit back and listen. But there are times where my perspective is explicitly unique like talking about social media, talking about E- Sports, talking about the younger generation because it’s a different thing to study the effects of the culture surrounding these things and it’s another to be a part of it. So, there are parts where I can lend my, I guess you could say expertise, but really, it’s the experience of being in this sort of cultural space where I can lend my opinions or my big observations surrounding the next leap of the next generation of exposure to the NTT IndyCar Series. PB: You also are a bit of a leader regarding how young you are. I understand there are a lot of things along with hard work that must fall in place, but you are a bit of a trendsetter in that way. Being the youngest NTT IndyCar Series owner in the history of the sport. There is an opportunity for you to really influence the future. And I think it’s really cool. Hear Steinbrenner’s thoughts on being a young owner and the influence he has and is building for the future of the series. PB: Realistic goals for the 2019 season with St. Pete right around the corner. GS: On the competitive side, being that we have a rookie driver and our partnership with Mike Harding is so young (their first year in INDYCAR was last season) there are a lot of new things on the team side. So, I think with, with our rookie driver, with a lot of our new crew, new staff just sort of getting main laps under our belts, we can have a competitive car. Fight for top ten finishes. Fight for the occasional podium and if we could get a race win, that would be the ultimate goal and obviously winning the Indy 500 as it is for every team. But, just being able to be competitive, be toward the top of the timing sheets, finish races, get as many laps under our belts as possible is important to all of us. The ultimate goal, what would be a top 10 in series points to show that we can be competitive, we can be consistent, we can stay, every weekend, week in and week out with a competitive car. So that’s really where we’re at from an operational standpoint. PB: I think there is a misconception that you have money pouring out of your pockets. I guess the easy answer to combat that is just through the hard work that you’re putting in. GS: That’s exactly it. It’s an understandable thought process thrown at me and my whole life. It’s just hard work and it’s putting commercial partnerships together, putting other companies’ logos on the car. People will assume that I’m shelling out $8 million checks where that’s just not a realistic, that’s not realistic for me, especially being so young. It’s not like I can knock on a door and get a $10 million check. It’s just not how my family operates. It’s not how they’ve ever operated. I have to prove that, that this is something sustainable and something I’m capable of doing. Thankfully I have a family who’s familiar enough with motor sports being a Midwestern based family and most of them went to school at Culver Military Academy (in Indiana) so they’re all familiar with what the Indy 500 is and they’re all familiar with INDYCAR and they’re familiar with how difficult of a business it is, especially when we were in Indy Lights and they’ve made it very clear that we’ll help you out in any way they can. To make this work, it’s going to be on my shoulders. I wouldn’t want it or have it any other way. I want to prove myself. I want to prove that I can make it work, that I can work with people and we can make it work. I want to prove that Harding Steinbrenner Racing can make it and get it done the way that the sustainable by getting commercial partnerships, being competitive on track. I wanted to prove that we can make it happen. PB: And for you personally, that’s the challenge isn’t it? I know you’ve been hit with that stuff constantly, but for you it is number one, separating my Steinbrenner from everyone else’s Steinbrenner that everybody knows and making a name for yourself. From a personal perspective that has to be a huge goal – to claim your own ground, set something and be successful in something that you did on your own shoulders, not because you’re a Steinbrenner. GS: That’s my goal. I have two passions in life and that’s baseball and motor sports. And I thought, well, we already have one of them locked down pretty well – why not go out and prove that I can get it done in the business world, in the sports business world and in the NTT IndyCar Series. It’s something that I’m passionate about and I want to do it the way that is sustainable and follow the roadmap of teams like Ganassi, Schmidt, Michael Andretti who have done it for years and years and that’s doing it on the back of hard work with great commercial partnerships, good team chemistry, good folks in the marketing department and in the management, good people on the crew, just get good people in general. People are the main ingredient in a sustainable model. Again, learning from Bryan Herta then from Michael Andretti I’ve been able to see in years of being a fan of the sport, the unsustainable model and how that can work for a short period of time, but it’s very stressful and often does not lead to success and it leads to short term teams unfortunately. Obviously, I want to stick around in INDYCAR as long as possible. I wanted to come in and sort of a do it the way that I’d seen it done right and done in a way that’s sustainable. GS: YES they do. They really do and I’m sure you can ask any owner in the paddock what was that first year like? And I’m sure there’ll be a lot of similar stories, but it’s working toward that ultimate goal and not putting short term relief at the forefront. We’re really working our butts off to make it work and we’ve done a great job so far. The team at Harding Steinbrenner has accelerated the process to put us where we feel we need to be to get this car through 2019 and then beyond.